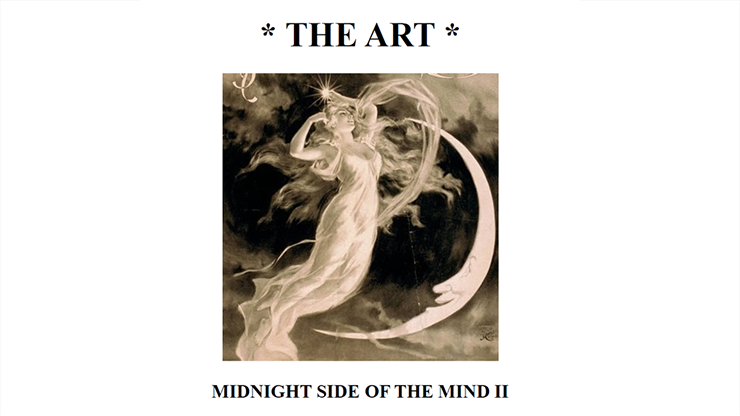 Paul Voodini presents The Art: Midnight Side of the Mind II. This is the follow up work to 2011's groundbreaking Midnight Side of the Mind, and as such should not be purchased unless you have a copy of Midnight Side of the Mind. The Art: Midnight Side of the Mind II covers many new routines and ideas while also offering expansions and ideas from the original Midnight Side of the Mind. New routines include Sitting in Circle where a group of people are given the gift of clairvoyance, The Ghost of Highgate Cemetery where a volunteer is taken on a journey to a graveyard, and The Ganzfeld Experiments which is an entertaining adaptation of the Ganzfeld ESP and telepathy experiments carried on in the mid-to-latter 20th Centuries. Other gems include the Candle Ritual and a new relaxation ritual - perfect ways to get your volunteer(s) in the perfect frame of mind for the routines that are to follow. If you already own Midnight Side of the Mind, The Art: Midnight Side of the Mind II will expand your horizons even further and will add to your "dream scaping" repertoire.